(Newser) – If any of the old-timers at your holiday gatherings this year complain about how basketball players have gotten soft and the fouls aren't as hard as they used to be, tell them to blame the game's inventor. 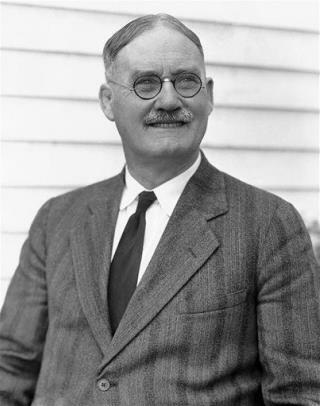 A newly discovered audio recording of James Naismith—thought to be the only one in existence—has him discussing the first ever basketball game, which took place in 1891 in Massachusetts, the Kansas City Star reports. It apparently didn't go well. "The boys began tackling. Kicking and punching in the clinches," SBNation quotes the audio recording. "They ended up in a free-for-all in the middle of the gym floor." There was no hole in the bottom of the basket, so after the ball got stuck in the basket there was nothing left to do but start a brawl. Oh, the good old days. Weren't they just grand? all games were like that then. now we are civilised!